Back in 2004—the same year as I moved into my studio at One Cottage Street—I landed a solo show of my paintings at Woodstar Café in Northampton, Massachusetts. I could have shown older, existing work; instead, I chose to create an all new body of work united by a theme. And for the theme, I decided to interpret “a day in the life of a bee.” This provided ample opportunity to explore a diverse array of imagery. 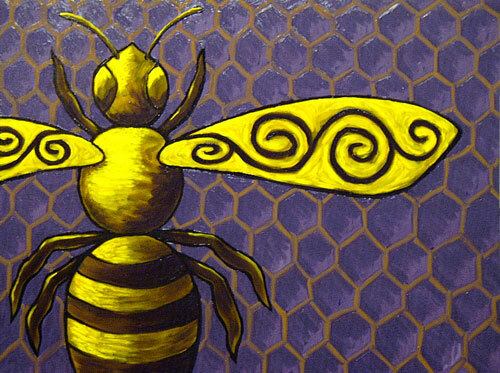 The title of the series, Place To Bee, is inspired by a Nick Drake song Place To Be. Several of the paintings in this series involved flowers. They’re such an interesting subject, what with all the repetition, pattern, and color. 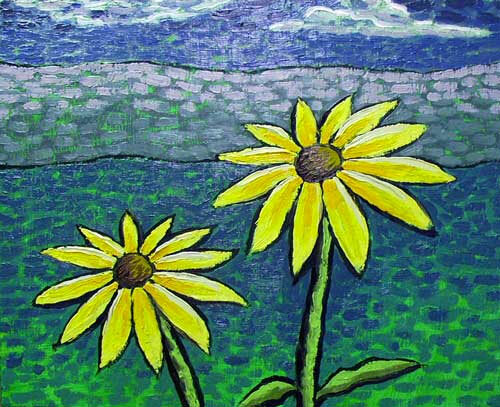 This one stylistically interprets a couple of black-eyed susans—one of my favorite flowers. I painted this pair of beauties using oil paint, mixed with just enough medium to make it malleable. In this way, I was able to render the scene in an impasto style, where the brush strokes are very three-dimensional, thick, and textural. Not long after I’d hung the show at Woodstar, I received a message on my home phone’s answering machine (remember those?) from a fellow who was apparently a professional apiarist. He left a lengthy message, taking issue with the anatomical incorrectness of my “Honey Bee.” I had assumed—incorrectly—that the swirly shapes on the wings would be the giveaway that this was a stylized tribute to the noble Apidae, not a literal one. So to be clear, I have retitled this one Hunny Bee. Hopefully the reference to Pooh will be an adequate nod to its fantastical intent. Queen Bee is the master of the hive. 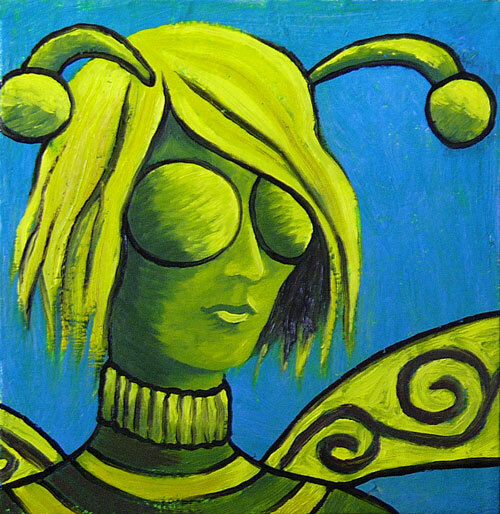 And she’s a real cool character too, in her bug-eyed glasses, her pom-pom antennae, her horizontally-striped turtleneck, and her swirly-patterned wings.